For the entire morning, it appeared the NBA trade deadline would come and go with a whimper. Then, around lunch, the Cleveland Cavaliers decided to tear apart their roster on the fly and set the stage for a wild few final hours Thursday. 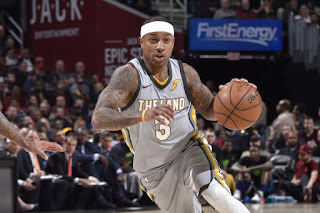 The Cavaliers made a series of major moves, sending out Isaiah Thomas, Dwyane Wade, Derrick Rose, Channing Frye, Iman Shumpert and Jae Crowder in three separate trades. They brought back Larry Nance Jr., Jordan Clarkson, George Hill and Rodney Hood in moves they believe will set them up for the present and future. There were a few other deals, including some involving past first-round picks. But there is nowhere else to begin the deadline reaction than with the rubble in Cleveland. OK. That was something. ESPN's Adrian Wojnarowski first tweeted the Cavs and Lakers were nearing a trade at 11:56 a.m. ET. Fourteen minutes later, we knew Thomas, Frye and a first-round pick were heading to the Lakers in exchange for Clarkson and Nance. That by itself would have been enough for a satisfying deadline day. Thomas has been the subject of near-constant ridicule since he returned from a hip injury Jan. 2, with many criticizing his poor play on both ends of the floor and his strange penchant for talking out of turn in the media. The Cavs were significantly worse since Thomas' return, and it was clear to everyone this wasn't a good fit. "He's worked too hard to get back, and he's a ball-dominant player," Thomas' agent, Aaron Goodwin, told Joe Vardon of Cleveland.com. "It's LeBron's ball, and this clearly wasn't working. Koby (Altman) and I have had enough conversations where it was clear, with the way the system was going, it wasn't beneficial for either party. This is a good opportunity for Isaiah." But the Cavs were far from done. Within an hour of the Thomas trade, Wade, Rose, Shumpert and Crowder were sent packing to new destinations. Cleveland sent Rose and Crowder to the Utah Jazz and Shumpert to the Sacramento Kings as part of a deal that brought back Hood from Utah and Hill from Sacramento, per Wojnarowski. Joe Johnson will head to the Kings as well. In a subsequent move that shocked almost everyone, the Cavs then facilitated a swap to send Wade back to the Miami Heat in exchange for a second-round pick, per Wojnarowski. Wade likely would have felt a playing-time crunch with the Cavs' new young players on the wing and backcourt. After all that, Isaiah Thomas played 15 games in Cleveland, and the Cavs had to attach a pick to him to get two (solid) players off the Lakers bench -- one of whom LA had been trying to trade already (Clarkson). The New York Knicks added backcourt athleticism, acquiring Emmanuel Mudiay from the Denver Nuggets as part of a three-team deal with the Dallas Mavericks. The Mavs sent Devin Harris to the Nuggets, and the Knicks traded Doug McDermott to the Mavericks to complete the swap, per Woj. Mudiay is the most notable piece as a 21-year-old who was the seventh overall pick in 2015. He's seen his minutes and production wane every year since his rookie season, including a demotion from the starting lineup this season. The Knicks had been looking to add athleticism to their backcourt as they await rookie Frank Ntilikina's development. Me in 2014: Mudiay is the next John Wall. Me in 2018: Mudiay getting traded for Devin Harris seems fair. No question Emmanuel Mudiay will be excited to relocate to New York. I remember speaking with him during the predraft process. He was hopeful to land in NYC and said he'd have no problem fitting in. In a somewhat similar move, the Orlando Magic sent Elfrid Payton to the Phoenix Suns in exchange for a second-round pick, per Woj. Payton is a restricted free agent this summer but is in the midst of his best offensive season, averaging 13.0 points and 6.3 assists per game on a career-high 52.0 percent shooting. The Suns do not have a natural starting point guard and have been using Devin Booker as their nominal 1 for large stretches. Payton's acquisition should allow them to move Booker to a more natural secondary ball-handler role. 0 Response to "NBA Trades 2018: Post-Deadline Roundup and Twitter Reaction"